The Lake Eacham self-guided walk is approximately 700m long and will take approximately 30 minutes to complete. The walk extends from the National Parks Headquarters to the lake’s edge with 16 points of interest along the way. The Lake Eacham self-guided walk originates close to the Crater Lakes National Parks Headquaters. 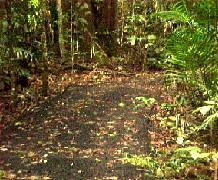 Therefore, getting there is very easy from The Chambers Wildlife Rainforest Lodges. You can go for a short walk down the drive from the Apartments and turn right to take you to the headquarters and then a left to go down the short roadway.